Showing results for tags 'for sale'. Selling my pair of 1989 klipsch La Scalas. They come with the original type Al crossover. I purchased the Crites A/4500 crossovers and CT120 tweeters. ($455 total when I purchased them) I also had him drop the mids down 3db on the crossovers. This tamed the mids some and brought out more bass. You can reverse this if you would like. I have before and after pictures if you prefer to go back to original Crites settings. The Type AL still sounds good and gives you 2 options when you are listening to them. Both are included in the sale. The speakers are still in great shape obviously but aren't perfect. The only real thing that needs to be pointed out, besides the fact that the area that holds the crossovers needs a good dusting, is that the tops have some small areas to take note of. I added a big 2X2 piece of tile with felt on the bottom to the tops of the La Scalas (shown in pictures) This gave me the ability to place a lamp or an amp on the tops without concern for damaging them. They Still sound fantastic. Local pickup only. No returns and No refunds. Make me an offer. Enjoy! Selling a pair of 1989 heresy standing speakers (in birch raw finish) with angled risers and a KV-1 center channel. This sound system was purchased in February of 1989 and has had no previous owners- so it's in excellent condition. I've had offers on Facebook and from some friends but I would love to sell them to someone who truly appreciates Klipsch! Let me know if you're interested. I bought a Klipsch Powergate around a month ago. All cords and accessories (including remote) and original box included. Here is a link: https://www.klipsch.com/products/powergate I'm looking to sell for $225, shipping included. 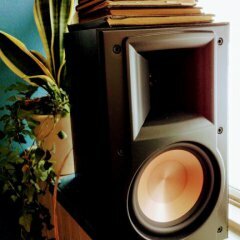 Original Klipsch Forte speakers. Conservatively rated 8/10. Consecutive serial numbers. They look great and sound fantastic. Grills are in perfect shape with original badges. Look at the pics and ask questions. They are ready to be hooked up and enjoyed. No trades and Not willing to ship. I need to sell these so make an offer! These speakers are really in decent physical shape, not perfect. I have more photos and am absolutely willing to do a "video tour" to show fronts sides and back all together on both if anyone is interested. Had them in my living room for quite a while, they are just too big for my house though. Sound amazing to me but I really don't know much about speakers or sound systems. I have a feeling someone would love to have these for a better than decent price so make an offer if you are interested. They are heavy too so I don't really want to ship them, wouldn't even know how to do that, but I suppose I would entertain the idea if you are paying for the shipping. Better if you are in driving range of Austin Texas and can come get them. OK go... don't be shy. Time for me to UPGRADE to the new RF7 iii's. I purchased these RF-7 ii 's, before the latest release of the Klipsch RF7 iii 's . ~Speakers are in New Condition ! Come and grab 'em today ! (HOUSTON) ~PRICE REDUCTION to $1475 , ...let's make the deal NOW ! Hi everyone, I am looking for additional information and potential buyer regarding a pair of vintage 1950s klipschorn speakers in excellent working condition. The serial#s are 1671-1672 on the cabinets and 1832 & 1681 on the horns. I'm looking for information regarding their collectibility, value and a potential buyer. I'm located in Houston so anyone local interested please msg me otherwise I can ship at buyer's expense. EDIT: All sold Due to a number of reasons, I must downsize my collection that I have amassed over the years. Prefer local pick up in the Washington, DC area for the larger items. Pair of KP-301's. Great shape but with some shadowing on top of one. 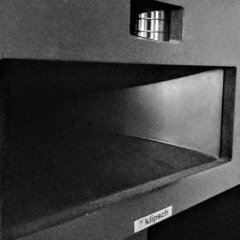 SOLD Album: http://s458.photobucket.com/user/hov99/library/Klipsch For Sale/Klipsch KP-301 ____________ Pair of black La Scala's, consecutive serial #'s. LS FB TG Type AL. Tops are scuffed/scratched due to previous owner setting equipment on top of them. SOLD Album: http://s458.photobucket.com/user/hov99/library/Klipsch For Sale/Klipsch La Scala Pair of black Forte II's, consecutive serial's. "BLK #19 GRILL". Black finish fading in several spots, especially most of the tops and corners. SOLD Album: http://s458.photobucket.com/user/hov99/library/Klipsch For Sale/Klipsch Forte II Pair of KP-2500-C (twin of the KP-250's, but with the fur coating) SOLD Album: http://s458.photobucket.com/user/hov99/library/Klipsch For Sale/Klipsch KP-2500-C aka KP-250 2 pairs of KT-DS's, one set black and one set walnut. Black has omnimount holes, walnut does not. SOLD Album: http://s458.photobucket.com/user/hov99/library/Klipsch For Sale/Klipsch KT-DS Seaton Submersive HP in Black Oak, still have original shipping box and foam packing materials keeping it pair of JBL 4645C http://www.jblpro.com/www/products/cinema-market/subwoofers/4645c SOLD Possible sales: pair of KSP-400's http://www.klipsch.com/products/ksp-400-floorstanding-speaker SOLD matching KSP-C6 center channel (would prefer to sell with the KSP-400's) SOLD I'm keeping my cornwalls and epic CF-4's and the associated centers and surrounds for them. EDITED to change prices and remove sold items. 2x Klipsch RF-62 II Floorstanding Speakers for Sale! Looking for around $250 each $500 for both or best offer. They are adult owned, never abused, smoke free home and will ship in the retail boxes. I can ship anywhere in the USA. I will ask whoever buys these to pay for shipping. I will charge actual shipping costs, nothing extra. I get a huge shipping discount 60%+ off UPS rates. Speakers are located in Southeastern Pennsylvania, Philadelphia Suburbs. I will attach some picture tonight. More pictures are available upon request. I can also upload pictures of the boxes as well. Thank you! For sale is a KV3 (SN 056796269, bought 5/16/97) that I purchased used four years ago. This center channel speaker is in acceptable physical condition (I received the speaker with the veneer chipped on one side), but still sounds great. We recently moved and the new entertainment center situation no longer allows me to use this particular speaker. Asking $100. Also, I've got some older AV equipment from my dad's collection (he had Klipschorns that we sold, Heresey's that I'm keeping, etc...) that is looking for a good home if anyone is interested. There's a BSR EQ-3000 stereo frequency equalizer, a Crown D60 dual channel amplifier, and a Yamaha K-960 cassette deck. Send me an offer if you're interested in anything. Finally, if anyone has a slim (<6" deep, < 7" tall) center channel they're looking to part with, please let me know. Thanks! We have a pair of one-owner Klipschorn speakers model K C F R, purchased new approx. 1973 & not moved since delivered. Serial number of one speaker is 5L189, other speaker may have matched number. Original fabric & wood (stained medium brown, perhaps fir) and no blemishes. Likely have original manuals. No hard use – classical music listener. There was no distortion, etc., when the speakers were last used but that was a few years ago, just sitting in living room since. Plan speaker test this week. Price is $2000 for the pair. Speakers are near Chicago. By far the best would be to have the speakers removed this Thursday, Friday or Saturday (Sept 1, 2 or 3, 2016) but they must be removed before Oct. 1. Gently used in our home since purchase new. Asking $1800 for the pair. In very good condition.